Fidget spinners existed for quite a few years before their sudden rocket into prominence and popular culture in 2017, when they took the world by storm. Often billed as a toy intended to help with anxiety, stress or nervous energy, for a while it seemed like everyone was walking around with a spinner -- flat, multi-lobed with a ball bearing at the center –– whirling merrily away in their hand. But it turns out that these fidget spinners could be more than mere toys. Some new research from the National Taiwan University has found a surprising use for the toys: separating blood plasma for diagnostic tests. Many types of blood tests require separating blood cells from plasma as the first step, before a doctor can perform any testing. Plasma is a yellowish fluid that contains proteins, bacteria, viruses, metabolites and other substances--many of which can be used to diagnose a wide range of diseases. Typically this is done through a process called centrifugation, which uses high-speed rotation to sediment blood cells. Medical centrifuges are quite expensive, however, and also require electricity in order to operate -- two requirements that often limit the feasibility and availability of centrifuge equipment in regions with limited resources, such as the developing world. 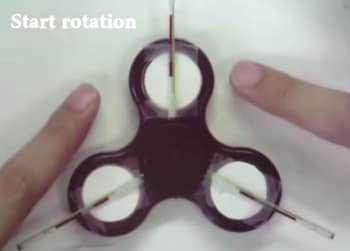 Chien-Fu Chen, Chien-Cheng Chang and their colleagues at NTU wondered if commercially available fidget-spinners could generate enough force to separate blood plasma, as easily as the flick of a finger. To test their idea, the researcher team placed human blood samples in tiny tubes, sealed the ends and taped a tube to each of the three prongs of a fidget-spinner. They found that by flicking the spinner with a finger three to five times, they could separate about 30 percent of the plasma with 99 percent purity in only four to seven minutes. Chen, Chang and their team believe that their new approach, recently reported in ACS’ journal Analytical Chemistry, could be ideal for medical applications in regions of the world that lack electricity and other resources. For more healthcare tech, check out A Healthy Future for Artificial Intelligence in Healthcare.